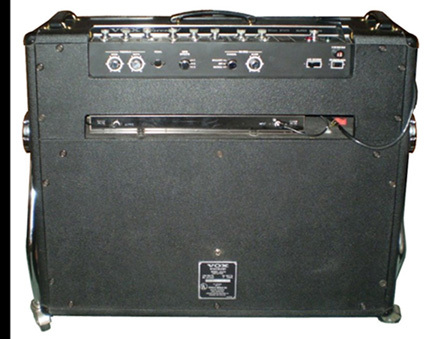 Thomas Organ introduced three generations of the Viscount amplifier between 1966 and 1968. 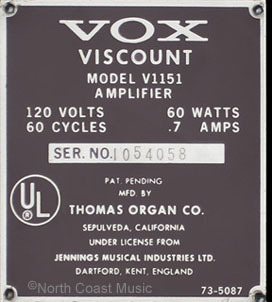 V-15 or V115 Viscount Amplifier - Introduced in early 1966, the first generation V-15 and V115 Viscount circuits were electronically identical and documented on a single schematic from Thomas Organ. 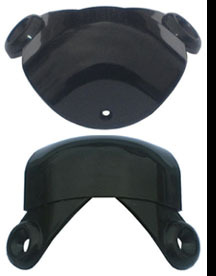 The amplifier was rated 35 watts RMS, 70 watts peak into a 8 ohm load. 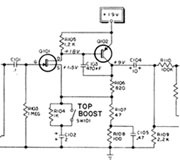 The three channel amplifier featured tremolo in the "Normal" channel, reverb that was selectable to either the "Normal" or "Brilliant" channel and MRB or "Mid Resonant Boost" in the "Brilliant" channel. 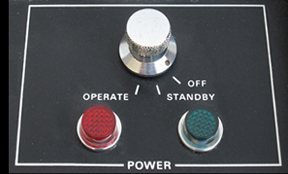 The "Normal" channel included a "Top Boost" rocker switch while the "Bass" channel featured a sweepable frequency tone control called "Tone-X." The cabinet styling was patterned after the JMI Vox AC-30 amplifier, albeit somewhat larger. 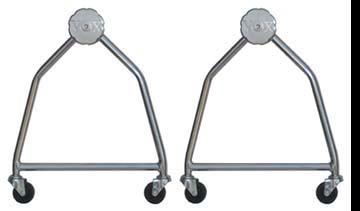 A pair of tubular, chrome plated side swivel stands with casters, three Vox logo handles, six Vox logo vents, eight plastic "one pin" corners and a vinyl protective cover were included. Two 16 ohm, 12 inch Vox Gold Bulldog speakers, wired in parallel to 8 ohms, were installed in the amp. 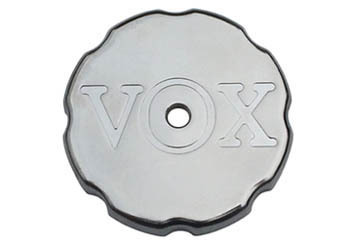 These speakers were manufactured for Vox by the Oxford Speaker Company of Chicago IL. Two separate foot switches were provided with the amp. 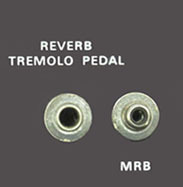 A two button foot switch with a 1/4" TRS (stereo) plug controlled the reverb and tremolo. 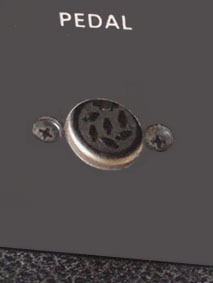 A second single button "egg" shaped foot switch remotely controlled the MRB feature via an electro-magnetic relay located inside the amp. When the MRB button was depressed on the foot switch, you could actually hear the clicking sound of the relay from inside the amplifier. V1151, V1152 and V1153 Viscount Amplifiers - Introduced in June 1966, the second generation V1151 and V1152 Viscount expanded and refined the design of the previous V-15 and V115 models. 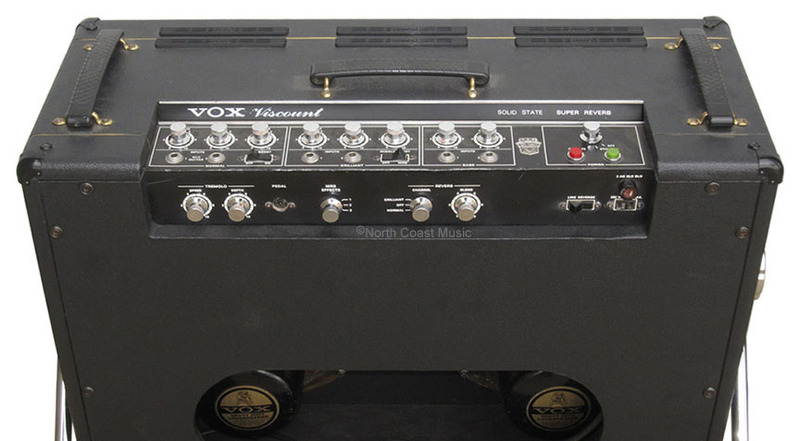 The new amp retained the same three channel design as the earlier model. The amp was rated 35 watts RMS, 70 watts peak into a 8 ohm load. The V1152 Viscount included the same features found in the V115 amp (reverb, tremolo, MRB, Top Boost and Tone X) but the effects were controlled by a new three button foot switch that consolidated the previous two foot switches into one. The V1151 Viscount added a Distortion Booster, or "fuzz tone," to the list of features included in the amplifier. There was no control panel switch for the distortion effect nor were there any controls to adjust the intensity of the effect. 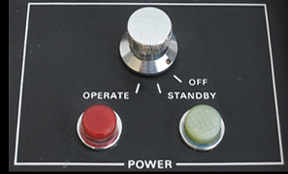 The distortion circuit was activated by a foot switch on a new four button remote foot switch. The amp featured an open back. The V1153 Viscount arrived in 1967. 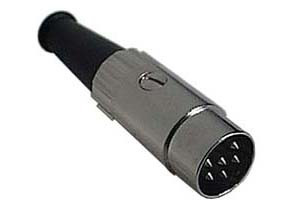 It added a two-piece closed back to the V1151 version of the amplifier. See photo below. Circuit Design - The V1151 modular preamp section was originally designed for the Viscount and Buckingham series amps by Thomas Organ/Vox engineer Sava Jacobson. The entire V1151/V1152 preamp section was interchangeable with those used in V1121/V1122 Buckingham, the V1131/V1132 Royal Guardsman and the V1141/V1142 Super Beatle amps. The preamp section was sealed inside an rectangular steel enclosure that also included the control panel. The preamp circuitry was designed on three printed circuit boards. One of these three boards included the Distortion Booster circuitry, another was dedicated to the reverb circuit. The third and largest circuit board included individual preamp and tone control circuits for all three channels, along with the components for the Top Boost and MRB switches plus tremolo and Tone X. The foot switches controlling the V1151 "Fuzz" and "MRB" circuits actuated electro-magnetic relays located inside the preamp chassis that enabled the effects. When the "D" or "M"
button was depressed on the four button foot switch, you could actually hear the clicking sound of the relay from inside the amplifier. On the basis of amps I have recently inspected, I am led to believe that the fuzz tone circuitry was actually present in the V1152 chassis, despite the fact that fuzz tone was not included in the list of features for the V1152 amp. It appears that the only real difference between the V1151 and V1152 Viscount amplifiers was the foot switch included with the amp. 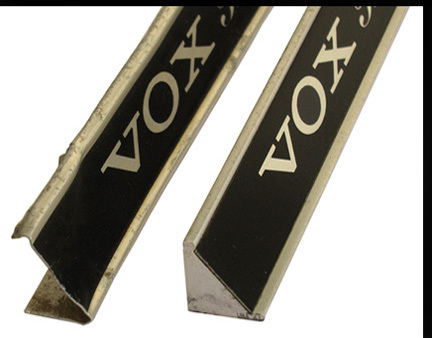 If one connects a Vox four button foot switch (Reverb, Tremolo, MRB and Distortion) into a V1152 amplifier and actuates the "Distortion" button, the V1152 will have fuzz tone. The V1152 Viscount did not have a serial number plate specifically produced for the model. Rather, Thomas Organ put a sticker with the number "2" that covered the last "1" on the V1151 serial plate. I believe that this simple method of changing the model number facilitated the rapid creation of the V1152 on the V1151 production line. Exchanging the four button foot switch normally equipped with a V1151 to the three button version completed the V1152 conversion. The Thomas Vox Viscount was still evolving. Not only had the V-15 and V115 been replaced within months of their introduction with the improved V1151, V1152 and V1153 models, even more revisions were in the works. 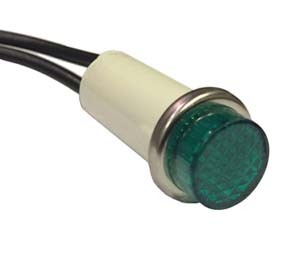 The V-15, V115 and early V1151/52 Viscount amps were equipped with "frosted" red and green pilot indicator lenses (see photo, near upper right). These were changed to translucent, or clear lenses in the later production of the V1151/52/53 amp models (see photo, lower right). An "E Tuner" circuit was also added to later production runs of the V1151, V1152 and V1153 amps. 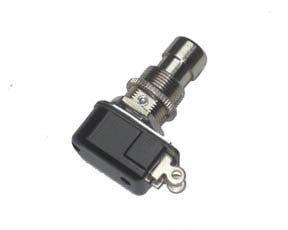 This circuit provided a reference "E" pitch that would assist in tuning a guitar. This circuit dipped into the Thomas home organ parts bin, using a tunable inductor coil and a transistor in a basic organ oscillator circuit. The "E Tuner" was connected to the volume control of the Bass channel. 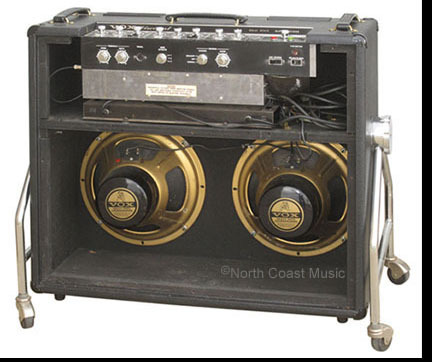 When initially added to the amps, a rear panel rotary switch activated the reference tone. 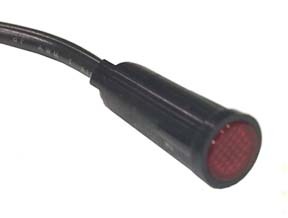 Later models utilized a slide switch. Some of the changes introduced by Thomas Organ to the V1151/52 models were aimed at reducing production costs. The solid aluminum escutcheon at the rear of the control panel of the V-15, V115 and early V1151/52 amps was replaced with a thin aluminum stamping in the later production of the V1151/52. 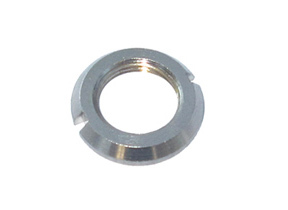 While nearly identical in outward appearance, the stamped part was susceptible to damage when removing the chassis from the cabinet for service. The photo at left shows both the solid and stamped escutcheon and the damage that could occur to the stamped part. Thomas Organ dropped the use of plywood in their cabinets as a further cost savings measure during the production of the second generation Viscount amps. 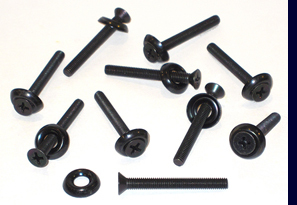 The new cabinets were made of particle board, a cheaper, heavier and less durable material. 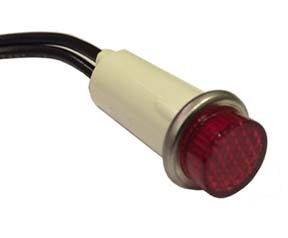 The three button foot switch for the V1152 and the four button foot switch with distortion booster indicator lamp that were provided with the V1151/V1153 Viscount amps are pictured below. V1154 Viscount Amplifier - Introduced in January 1968, the third generation V1154 Viscount amplifier again expanded and refined the abilities of the previous Viscount models. The new amp retained the same three channel design and retained all the features and closed back cabinet of the prior V1153 model. The amp was rated 35 watts RMS, 70 watts peak into a 8 ohm load. A new, one piece, and in a sense, "universal" preamp circuit board was designed by Thomas Vox lead engineer Stan Cutler to replace the two or three board preamp circuit board arrangement used in the V-15, V115, V1151, V1152 and V1153 amps. This new board was designed to incorporate all of the eight individual preamp and effects circuits found in the Viscount, Buckingham, Royal Guardsman and Beatle. The individual circuits included on this board were the first, second and third channel preamps, tremolo, reverb drive and receive, Repeat Percussion, mixer and "Watchdog" compressor/limiter. Thomas Organ would install electronic components only into the sectors of the preamp board that would be consistent with the features included in a particular amp model. No electronic components would be installed in circuit board sectors where the channel or effect was not included with the given model. As an example, the extensive list of features included in a V1143 Beatle head required a completely populated preamp circuit board. As the Viscount was a three channel amp with reverb and tremolo, it would utilize a nearly completely populated preamp circuit board. 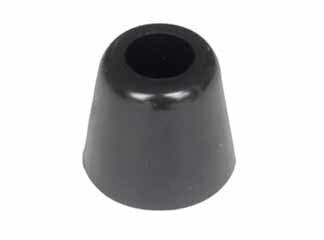 Only the Repeat Percussion sector was unused as this feature was unique to the V1143 Beatle amp. While the V1154 retained the features as the V1151 Viscount, it has always been my opinion that the fuzz circuit sounds smoother and more musical in the earlier V1151 Viscount than in the later V1154 model. The V1154 used FET signal transistors in the preamp to minimize noise and hiss. New, modern FET switching transistors in the Distortion Booster and MRB circuits replaced the electro-magnetic relays used in prior Viscount models. The "E-Tuner" circuit that had been introduced into the later production of the V1151 and V1152 Viscount continued in the V1154. What Year Was My Viscount Built? After looking at hundreds of Thomas amplifier serial numbers, I have come to the conclusion that the first digits of the serial appear to provide a clue to the year the amplifier was produced. Serials starting with "9" were from the first full year of production, 1966. Those starting with "I0" or "10" were produced in 1967 while those starting with "I1" or "11" were built in 1968. 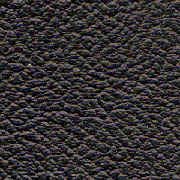 Following this same pattern, a serial starting "I2" or "12" indicates 1969.